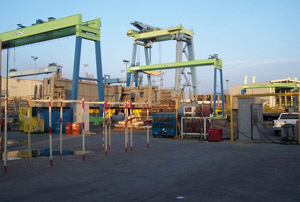 EMH Overhead Cranes in the Shipbuilding Industry | EMH, Inc.
Several EMH gantry cranes are used at a major West Coast shipbuilding facility. At Engineered Material Handling, we pride ourselves on quality Customer Service and Solution Development. We look forward to hearing from you.